Surely everyone with an iPhone wants one of these? CES Unveiled 2010 unveiled a number of great tech-related treats this year, but none come close to Parrot's ultra-cool iPhone-controlled AR.Drone. Greeting everyone as they entered the pre-show CES 2010 warm-up, the 'quadricopter' can fly around a room, powered by its four propellers each driven by a separate engine. But the best bit about the gadget isn't that it uses more wind power than your average wind farm but that it can be completely controlled by your iPhone. There are two cameras (one is wide angle and one is high speed) positioned on the AR.Drone which allow it to feed back information to your iPhone. This means that you can use the accelerometer in your mobile to control the copter. So if you want it to dive forward, you push the phone forward and to rise you pull the iPhone back. The manufacturer of the AR.Drone, Parrot, told TechRadar that the way it works is through its very own Wi-Fi network and that it is the ultimate 'augmented reality' app for your iPhone, as you are actually controlling a real thing. They also noted that there is even room for multi-player AR.Drone action. And it doesn't seem to be just the iPhone which will be able to control the AR.Drone – its makers have made the control system open platform, so expect an Android version soon. Before we got our hopes up to much, we asked a Parrot rep if the AR.Drone would be coming to the UK. The reply: "Of course. 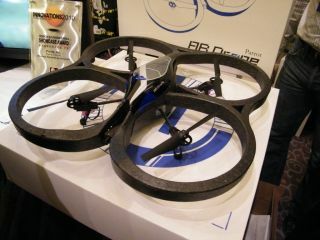 The European market will see the AR.Drone sometime this year."